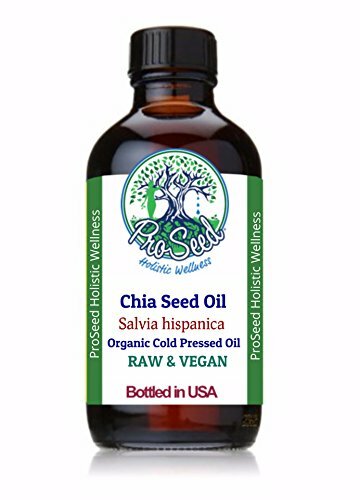 This virgin unrefined oil is extracted by cold pressing from organic chia seeds, known with the latin name Salvia hispanica. There are other oils from variety of chia species on the market however Salvia hispanica is the only one known to contain high levels of omega-3 fatty acids. Chia seeds are considered super food thus became a popular supplement. It is also praised as the vegan alternative to fish oil as it is high in omega-3 fatty acids typically associated with fish oil. This version of chia seed is the botanical alternative to fish oil. It has a 3:1 ratio of omega-3 to omega-6 fatty acids combined with its naturally high level of alpha-Linolenic acid (ALA) make this oil a valuable nutritional supplement. ALA is an essential fatty acid that cannot be produced by the body and must be obtained through the diet. 100% pure, virgin organic chia seed oil. Because it is not refined and no heat is involved in the process this is a RAW food. Comes in a dark glass bottle. Because it is pure and not refined slight sedimentation may occur. Shake well before use. I make my blends per order so as always if you like it to be customized or if you have questions please inbox me. Feel free to read about me on the info page and buy with confidence. As a member of several leading industry organizations I only support the safe and effective use of essential oils that are supported by the scientific literature. All orders are made and bottled in small batches. All essential oil blending is made personally by me, a NAHA certified Aromatherapist, and a Master Herbalist. All my products are organically grown or wildcrafted (pesticide-free/herbicide-free/no synthetic fertilizers or other chemicals) and Non GMO. Free from any artificial colors, flavors, or other synthetic material.